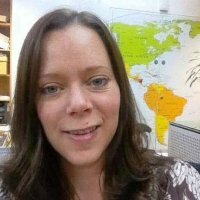 I work at Concern Worldwide and we are interested in maps for logistical and planning purposes, and we are aware of the potential of openstreetmap. 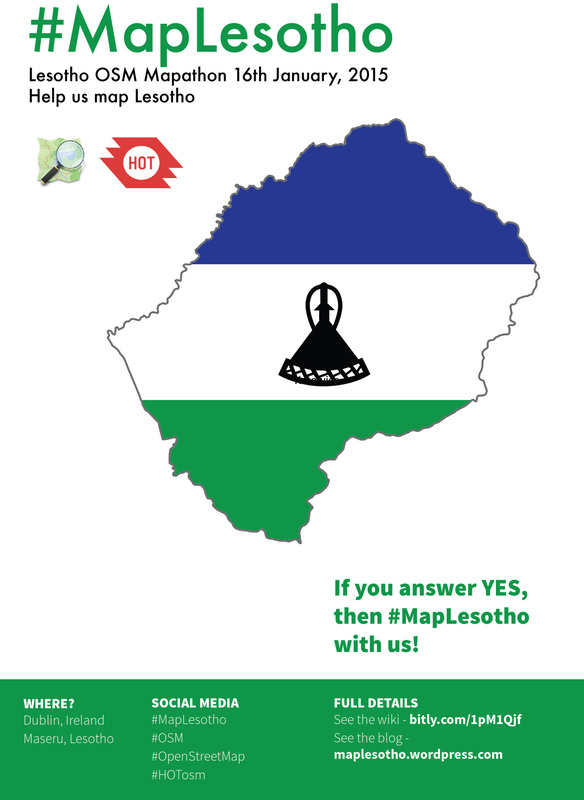 When I heard about the HOT Missing Maps project, and that a school in Ireland was mapping Lesotho I was keen to get involved and find out more. Many of our programmes are in countries which would benefit greatly from improved maps for disaster preparedness and response, and it is fantastic that other organisations and volunteers are looking at this too. 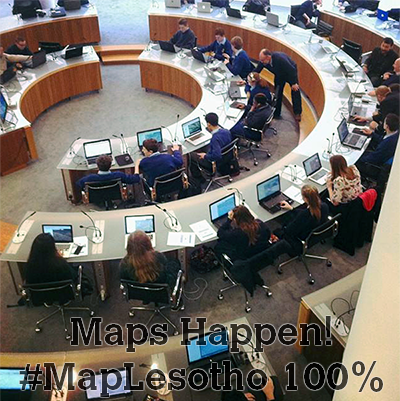 So myself and a colleague Ray accepted an invitation to take part in the Map Lesotho project by attending the event at Fingal County Council offices in Swords. On arrival we were taken to the chamber which is a beautiful space in which to work. The volunteers, mainly students from local schools were all able to see each other, and the organisers and mapping experts were free to walk around and answer questions. I was worried the mapping might be tricky, but it was very simple using the ID Editor, and within half an hour we were able to start marking features on tiles and label them. The student next to me agreed it was enjoyable and interesting to look at real photos of places we will probably never visit. And we both got a buzz from finding things, especially houses because we knew real people lived there. We might never get to travel to these places, but we felt a thread of connection as we added details to the satellite images from thousands of miles away. The event was very well organised by Ciarán Staunton and his colleagues, and we were kept motivated by coffee and lunch breaks but also by reminders of our progress: “95% of the country has now been mapped!” we were told and later “96% - keep up the good work!”. It was also good to hear some of the volunteers and experts introduced themselves and shared their knowledge of mapping and the country itself. The Lesotho Ambassador Paramente Phamotse helped us understand the shapes we were seeing on the maps, such as square fenced areas for livestock to be kept safe at night, and the different types of dwellings. Each new piece of information helped us focus on the task at hand, and as we completed more squares on the map a sense of achievement could be felt in the room. By the time we finished up the percentage completeness was 98% and it hadn’t felt like a day of work or school for any of us. I was really glad to see how simple and effective the volunteer participation with OSM can be. The maps being created now will be useful for many years to come and it’s one of the best uses of technology I have seen. I was surprised by much can get done in a day, and how enjoyable it was to take part. I will be signing up for the next event for sure.